and the provision of a social centre where the members could participate in cultural, educational, and social activities in a relaxed, familiar atmosphere. The Imperial Band Club derived its origins from “The Constitutional Orchestra Club” which was set up on 31 st August 1924. Four years later, a decision was taken to establish a Band Club, under the name of “The Imperial Band Club. In February 1929, the Club acquired its first instruments, 45 pieces to begin with and percussion instruments. 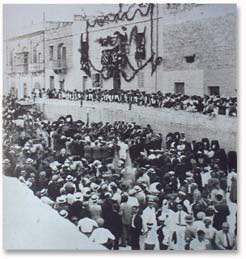 On 21 st September 1930, The Imperial Band Club gave its first musical programme in the Mellieha Village Square. Since then, it has never looked back! On July 23rd 1949 the Band travelled to Sicily and, in the famous Villa Bellini Gardens in Catania, delivered its first musical programme abroad, under the able direction of Mro. Anthony Sammut. Between July 2nd and July 9th 1995, the band travelled to Sousse, Tunisia, where it delivered several concerts under the direction of Mro. John Mamo. In October 1999 the Imperial Band delivered several concerts in Germany under the Direction of Mro. Anthony Borg. In November 2007 the Imperial Band under the direction of Mro. Anthony Borg participated in ‘Novello in Festa’ an annual cultural festival held in the town on Leverano (LE) in the region of Puglia in Italy. Apart from its regular commitments in the Village, the Band proceeded to involve itself in numerous engagement outside Mellieha and in a host of official celebrations on a national scale. Prominent amongst these, it is worth mentioning, the Imperial Band's participation in the Coronation Celebrations of King George VI in 1937, the festivities for the Coronation of Queen Elizabeth II in 1953, and its participation in the Carnival celebrations in 1958, in 1972, when the Band carried off the First Prize, and again in 1973 when the Band proved itself once more by placing second. Between 1969 and 1979, The Imperial Band Club, organized a yearly song festival, called Vocalissima, open to participants from all over Malta. The Imperial choir was formed in 1998 with the aim to perform during activities organized by the Imperial Band Club. Since then the Imperial Choir never looked back. Besides participating in concerts jointly with Imperial Band, the choir proceeded to involve itself in numerous engagements. Prominent amongst these were the joint choral concert with The James Lambert Singers from Wales, the successful tour in Germany in November 2004 and in November 2007 together with the Imperial Band at Leverano in Italy. 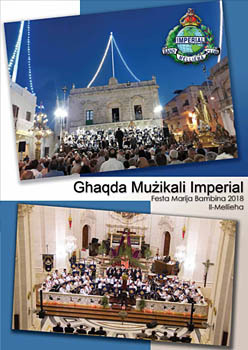 The Imperial Choir also participated in numerous religious engagements amongst them worth mentioning singing in masses officiated by Mgr Mario Grech Bishop of Gozo, by Mgr Paul Cremona Archbishop of Malta and by the Apostolic Nuncio for Malta Mgr Tomaso Caputo respectively. Its repertoire includes sacred music, classical, pop, folk and traditional Maltese music. Since October 2005 the choir’s director is Mro. Shirley Helleur. Today, the Band consists of about 50 musicians with its structure resembling that of a Military band, basically made up of wood, brass, and percussion instruments. Its repertoire includes Maltese marches, Maltese Folk music, classical and popular music from international sources. The Imperial Band takes great pains to teach musical theory to its trainee musicians and to hold regular rehearsals for these budding bandsmen.